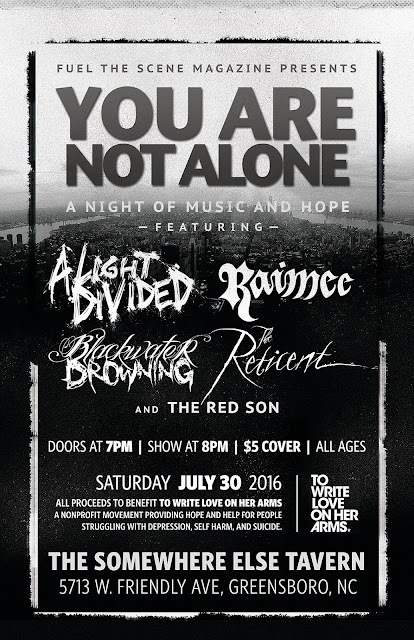 "GREENSBORO, NC— As a part of their "After All This" tour, Greensboro-based rock band Raimee will be headlining a benefit show for To Write Love On Her Arms at The Somewhere Else Tavern on Saturday, July 30th. The five-band benefit concert, which aims to raise awareness around issues of mental health and suicide prevention, is especially poignant for Raimee, who planned the show themselves. "I lost a very dear friend this year to suicide. And as someone who suffers from anxiety and depression myself, this is an issue very close to my heart," says vocalist Rei Haycraft, who coordinated the show. "There is a very real stigma around admitting issues of mental health, leaving our loved ones feeling hopeless and isolated. We're aiming to help change that." All proceeds from this show will go to To Write Love On Her Arms, a non-profit group dedicated to de-stigmatizing mental health issues and spreading a message of hope. The bill will include a variety of bands from across North Carolina: Raimee (Greensboro, NC), A Light Divided (Winston-Salem, NC), The Reticent (Charlotte, NC), Blackwater Drowning (Salisbury, NC), and The Red Son (Greensboro, NC), all of whom have very personal connections to the cause. To request interviews or press credentials to this show, please contact Fuel The Scene Media at management@fuelthescene.com or at 828.273.5939. The Somewhere Else Tavern in Greensboro, NC."